Everyone knows that wine and cheese pair perfectly. Craft beer and cheese pairings are becoming more and more popular. You can even pair cheese with fruit, nuts, chocolate and charcuterie. 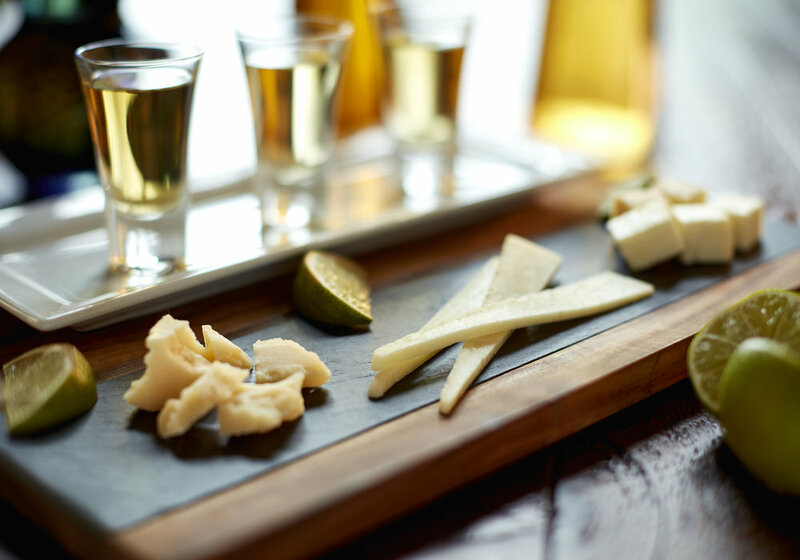 We want to broaden your horizons a little bit and introduce you to cheese and tequila pairings. That’s right….cheese and tequila. After aging for at least one year, Tequila can then be classified as an "Añejo". The distillers are required to age Añejo Tequila in barrels that do not exceed 600 liters. This aging process darkens the Tequila to an Amber color, and the flavor can become smoother, richer, and more complex. A new classification added in the summer of 2006, labeling any Tequila aged more than 3 years, an "Extra Añejo". Following the same rule as an "Añejo", the distillers must age the spirit in barrels or containers with a maximum capacity of 600 liters. With this extended amount of aging, the Tequila becomes much darker, more of a Mahogany color, and is so rich that it becomes difficult to distinguish it from other quality aged spirits. After the aging process, the alcohol content must be diluted by adding distilled water. These Extra Añejo’s are extremely smooth and complex. These tequilas are crafted by masters much the way the La Bottega di BelGioioso® cheeses are. When tasting the cheese and tequila together, it’s a good idea to start with the youngest tequila (Reposado) and work your way to the oldest (Extra Anejo). Take a sip of tequila and a nibble of cheese; repeat. You’ll find the complexity of the tequila and the cheese complements each other beautifully. The distinctive earthy flavor of the Italico brings out the smooth taste and clean finish of this 100% Blue Agave tequila. It is aged in oak barrels for a minimum of 6 months. This tequila has buttery notes with a smoky finish. Artigiano Classico is a mixed culture cheese that is unique to La Bottega di BelGioioso. The complex flavor of this cheese marries wonderfully with the many layers of flavor in the Don Julio 1942. This is a tequila that is made in limited quantities and is distilled twice to refine the flavors even further. It has a brilliant golden hue and a silky smoothcharacter that offers a truly unique tequila experience. La Bottega di BelGioioso’s American Grana Extra Aged Parmesan is aged longer than any of our other Granas or Parmesans. With 24 months of age, the cheese develops a tremendous nutty flavor and granular texture. The deep flavor of this cheese stands up extremely wellto the 100% Blue Agave Abandonado Tequila Extra Anejo. This tequila is aged for 4 years in American and French White Oak barrels that were previously used to age bourbon and cognac, respectively. It is ultra-smooth and has a sweet finish. We encourage you to experiment. Host a pairing party! Invite friends over and have them bring their favorite tequila….you provide the La Bottega di BelGioioso cheeses. Mix, match and compare your observations. Let us know what pairings you discover! ¡Salud! PS – Don’t forget a designated driver!